Buy this succulent as a rooted 1-gallon plant instead. Pedilanthus bracteatus, commonly called “Tall slipper plant”, is a plant with green cylindrical stems and widely spaced leaves which grow up to 4 inches long. Originates from dry deciduous woodlands in Mexico from Sonora to Guerrero. Very drought tolerant but can take regular water during hot summers. Maintenance includes trimming away branches that lay down to keep it upright. The removed branches can be left to dry in the sun or placed in containers and propagated. Care must be taken not to get very much white milky latex on your hands. Wear goggles and gloves. Any dried latex on hands can be cleaned off with a jelly type of engine cleaner or acetone. There are also several related species, one of which is Pedilanthus macrocarpus. Bracteatus has very green stems whereas macrocarpus has light blue-grey-silvery stems. 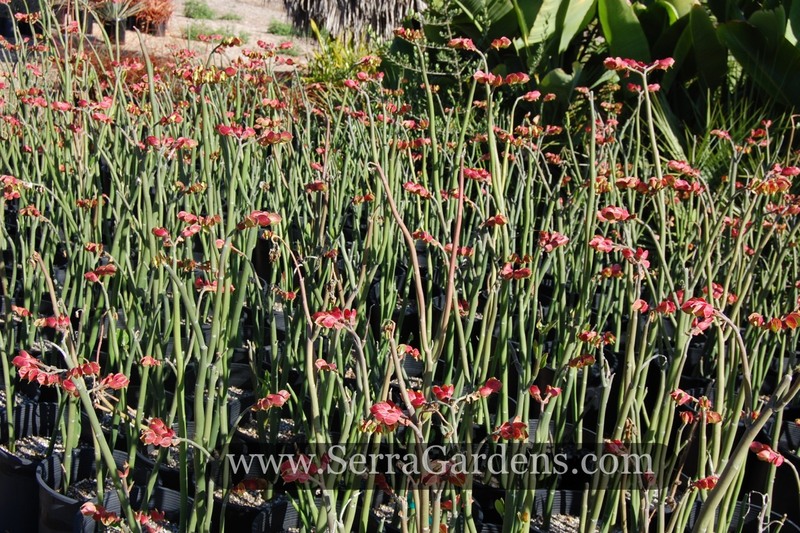 A nice vertical plant that grows to around 7 feet tall that is attractive in cactus, succulent and xeriscape gardens, and is also very impressive in a large container. This plant can be propagated from seed or stem cuttings. Pedilanthus bracteatus has green cylindrical stems and widely-spaced leaves which are up to 4 inches long. During the cold season the plant loses its leaves and is a mass of green stems. In spring through fall, it produces odd flowers which are sandwiched between rounded red bracts. The pale yellow-green flowers, termed "cyathia" by botanists, are specialized structures unique to Euphorbaceae and their close relatives. Many parts of Pedilanthus bracteatus are covered with small hairs. The plant's milky sap can irritate the skin. Tall slipper plant is believed to be auspicious in some Asian cultures. It is easy to grow and requires minimal care. It prefers well-drained sandy soils. Pedilanthus bracteatus flowers attract birds, butterflies and bees.